Guide-wire localised breast surgery is a technique used to remove an abnormal area in the breast that can be seen on ultrasound or mammogram but cannot be felt clinically. A tiny wire (similar to fine fuse wire or fishing line) is placed in the breast before the operation. This wire guides the surgeon to the correct area in the breast during the operation. Guide-wire localised breast surgery can be performed as a day surgery procedure or it may be part of a bigger operation for breast cancer. When is guide-wire localised breast surgery recommended? other types of breast biopsy are not able to confirm or exclude cancer and more tissue is needed for a pathologist to test. What is involved in a guide-wire localised breast operation? removing the abnormal breast tissue and the wire under general anaesthetic during an operation. The guide-wire will be put in by a radiologist or a breast physician. A few hours before the operation, you will go to a breast imaging centre or an X-ray department. 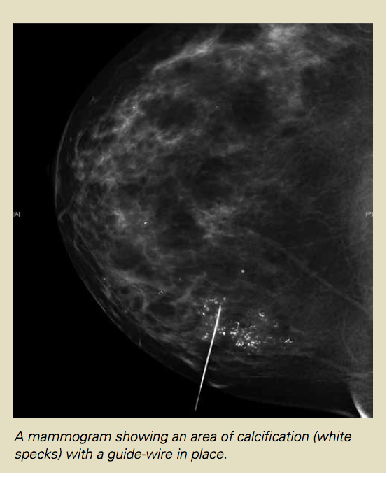 The abnormal area in the breast will be found with a mammogram or ultrasound. An injection of local anaesthetic will be given to numb part of the breast and the guide-wire will be inserted under the guidance of the mammogram or ultrasound. The method of guidance used depends on the type of abnormality in the breast. Often a mammogram will be performed after the wire has been inserted. The mammogram is performed with minimal pressure on the breast so that it does not make the wire move. This checks the position of the wire and helps the surgeon plan the operation. A mammogram may be performed even when the wire has been put in using ultrasound. Once the wire is in position, it will be taped in place and a dressing will be put on. Most patients don’t have any pain once the wire is taped in place. In some cases, more than one guide-wire needs to be put in. This is sometimes done for large areas of microcalcification or if there is more than one area to be removed. The operation – removing the abnormal breast tissue and the wire. When the wire is in position you will be taken to the hospital ward to wait for the operation. In the operating theatre, you will be seen by an anaesthetist. The operation will usually be performed under general anaesthetic. The surgeon will follow the wire and remove the piece of tissue at the tip.The wire will also be removed with the surgical specimen. Once the tissue is removed, it will be sent back to the imaging (X-ray) department where an X-ray or ultrasound of the tissue will be performed to confirm that the abnormal area is in the tissue that was removed. If you have been admitted for day surgery, you will be able to go home after a short period of observation. If you are staying in hospital, you will return to the ward to rest. After the operation the wound may be covered with steri strips (paper tapes) and a dressing. In most cases you will be asked to leave the dressing in place until your appointment with the surgeon. Usually stitches do not need to be removed because dissolving stitches are used. Your surgeon or nurse will give you instructions about what to do before you leave hospital. Before you leave the hospital, a follow-up appointment will be arranged for you. This visit is usually 7–10 days after the operation. You will see the surgeon or a member of the surgeon’s team at the post-operative visit. The wound will be checked and the results of the pathology testing will be discussed with you. What are the complications of guide-wire localised breast surgery? With all surgical procedures there are some risks and potential complications. Fortunately these are rare and guide-wire localised breast surgery usually proceeds without any problems. In about two per cent of cases the abnormal area is not found in the piece of tissue removed during the operation. There are several technical reasons why this can happen. The operation may need to be performed again if the abnormal area isn’t found when the pathologist tests the specimen. Most women do not have a lot of pain following guide-wire localised day surgery. Pain medication such as paracetamol is usually all that is needed for comfort. If the operation is part of your treatment for breast cancer, you may need stronger pain medication in the first few days. If you are in hospital during this time the nurses and doctors will make sure that any pain you have is controlled well and that you are comfortable. If you have the operation as a day-surgery procedure, you will be given information about how to manage pain. Most women are advised to wear a comfortable, non-wired supportive bra following surgery. Infection – this develops in up to four per cent of breast wounds. If infection develops it can usually be treated with a course of antibiotic tablets. Sometimes special dressings are needed. Bruising and bleeding– bruising is common after surgery and usually settles down by itself. Significant bleeding needing an emergency operation is extremely rare. Scarring– some scarring is unavoidable with any operation. Most breast biopsy wounds heal without causing a major change in the shape of the breast. If you are being treated for breast cancer however, a larger piece of tissue may need to be removed and this will cause a change in the size and shape to the breast. Your surgeon can give you information about where the scar will be and how big it is likely to be. More information about wound problems can be found in the ‘Wound Care’ brochure. Usually the guide-wire is put into the breast without any problems. The most common side effects are discomfort and bruising. Sometimes the doctor is not satisfied with the position of the wire and a second wire needs to be put in. Some patients find the procedure unpleasant and some may faint. An extremely rare side effect of guide-wire insertion is collapsed lung (pneumothorax). Tiredness and nausea following general anaesthetic are common and can usually be overcome with rest and anti-nausea medications. Allergic reactions to general anaesthetic drugs are possible but are extremely rare. It is important that you confirm where you need to go on the day of the operation. Sometimes you will be asked to go directly to the breast imaging centre and have the guide-wire put in before you go to the admissions area of the hospital. The arrangements are different at different hospitals. Check this carefully before the day of the operation. It is very important that you bring recent mammograms and ultrasound pictures with you on the day of surgery if your surgeon or radiologist has not kept them for you. If you would like more information about guide-wire localised procedures or the operation, please ask your surgeon, breast care nurse or another member of your treatment team.